Bowls, Berries, and The Big Screen! 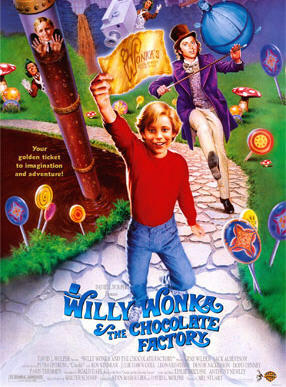 'Willy Wonka & The Chocolate Factory' is a classic family movie: Charlie Bucket, a poor boy who is barely able to support his family, is fortunate to be chosen as one of the 5 people to go inside the most popular and powerful chocolate factory in the world: The Willy Wonka Chocolate Factory. But a stranger, named Arthur Slugworth, tempts the kids to steal a piece of candy and give it to him. In exchange, he will make them rich. Willy Wonka, soon introduces them to the factory, and starts the grand tour around the factory. Once inside, the 5 winners start to run amuck. One by one, the 5 kids start to disappear, until it is only Charlie that remains. At this point, Wonka starts to ignore Charlie, and then tells him why: because Charlie and Grandpa Joe, drank some forbidden product without permission.